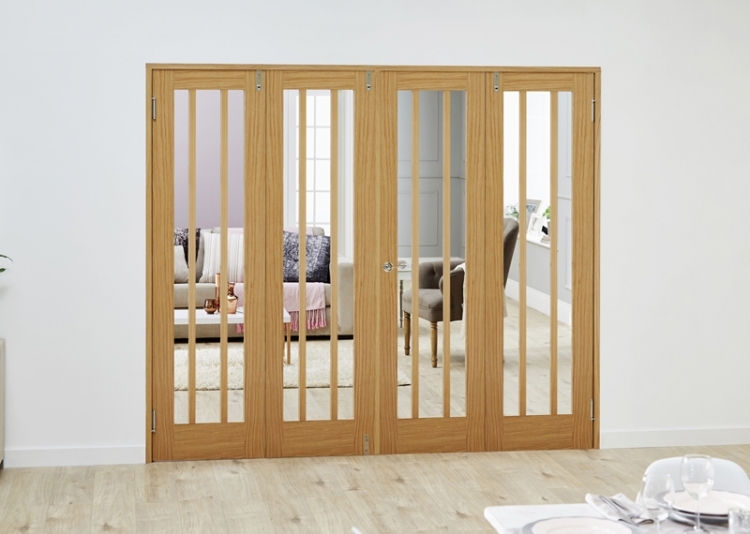 The Lincoln oak internal frenchfold room divider offers an innovative design that allows you to open up your living space when you choose, whilst still providing a daily traffic door for quick and simple access. Unlike the standard Lincoln oak room divider, this frenchfold option can be completely folded back, somewhat like an internal bifold door. You can create a warm and inviting environment with the Lincoln oak range, as this classic design makes the ideal door for a country cottage look. The vertical glazed panels add simple detail whilst the light oak wood is aesthetically pleasing, making this internal French door a winner all round. This door is supplied in an unfinished oak veneer so you can add the paint or stain of your choice, allowing you to match existing doors, windows or even flooring. If you prefer you can add a light stain or varnish to maintain the appearance of the natural wood. These doors MUST be decorated before installation, and we’d recommend a joiner is used for installation too. All internal French doors come complete with frame pack, door leaves and installation instructions. Hardware pack not included. To best select the option to buy, look at the door type you like and then review the product sizes that fit your needs. The Lincoln oak room divider range has an engineered core, ideal for thermal efficiency, strength, durability, and value for money.